Late Summer Show day. Needless to say, raining yet again. I don´t think we´ve had a weekend since July where it´s not tipped it down. Even my husband was heard to lament our lack of dry weekends today, when we were frustrated at hanging out the laundry yet again. Meanwhile, back at the apple trees. A few weeks back, when the schedule for the show was sent to me, I emailed back which categories I thought (optimistically!) that I´d be able to enter. Good job, as an excessively squeaky and awake baby stopped me remembering to phone up yesterday and confirm! I went to the venue to check I was still ok, was told I´d got precisely 20 minutes to stage my exhibit (oops!) and had to run/drive for it. Not the best time to discover the apples looked pathetic. Managed to grab enough to stage a couple of entries of apples and one of my minuscule minicole cabbages (looked like a pair of maracas!) and shot back off to the Baptist hall. They got me a second and two thirds, but only because there were only three entries!!! 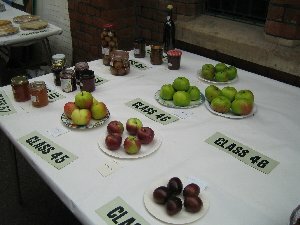 My Spartans came second to Vince´s James Grieves in class 45 (only two entries), while the awful Bramleys (they´re the ones at the back in this pre-judging pic) were last in 46. Interestingly, shows like this judge on taste etc. for cakes, pies and pickles, but for fruit and veg it´s almost entirely appearance. Not that the judges can dash off and cook half the produce, naturally, but my Bramleys did meet their end the following day in an apple crumble for my Church´s bring and share lunch. They were flawless inside, not a sign of codling (haven´t yet found one this year) and didn´t need that much sugar either. Delicious! The Spartans I´ll start to demolish for lunch this week, though they´re a bit tart for small boy who is still stuck with organic bought Galas. The Early Windsors (of which I´ve about four on the minarette tree) are much sweeter. I didn´t remember to look at the russet or the tripover!